Follow CIE all around the world as we make presentations to a wide variety of diverse audiences and communities on modern Israel. January 27-29, 2019: CIE led two sessions for participants at the annual Jewish Educators Assembly Conference in College Park, MD. We also celebrated JEA members who have participated in the annual CIE/ISMI Educator Workshops. January 20-22, 2019: CIE partnered with United Synagogue Youth for a special three-day Israel Seminar. Twenty teen participants representing 8 states took part in a wide variety of sessions focussed on enhancing their Israel knowledge and providing them with skills for creating effective Israel programming in their chapters and regions. January 13, 2019: CIE facilitated an interactive program for teens in grades in 11 and 12 as a kickoff event for "Knowledge for College" Program at Congregation B'nai Israel's in Tustin, CA. January 11, 2019: CIE leads two special Israel learning programs for students in the high school of the Milken Community Schools in Los Angeles. December 13, 2018: Eli Sperling leads the third of three seminars for 12th grade students at the Weber School as they prepare to spend a month in Israel. This session focussed on the development of Israeli culture and music. October 26-28, 2018: CIE hosted a second Teen Israel Leadership Institute. Twenty-four tenth and eleventh graders from nine sates and Israel engaged in intensive and hands on learning about Israel and Zionism. October 11, 2018: CIE Vice President of Curriculum and Outreach, Rich Walter facilitated a breakout session, "Multiple Tales of 1948," as part of the Jewish Education Project and Icenter seminar, "[email protected] Day of Learning: Connections and Complexities." October 11, 2018: CIE delivered an interactive workshop using primary sources on Jewish life and choices in nineteenth century Europe for students at Congregation B'nai Yisrael in Armonk, NY. The program emphasized that Zionism was one of many choices that Jews had at a time of rising anti-Semitism, and that it was taken by those who sought Jewish self-determination. October 10, 2018: CIE President Ken Stein leads the second of three seminars for 12th grade students at the Weber School as they prepare to spend a month in Israel. 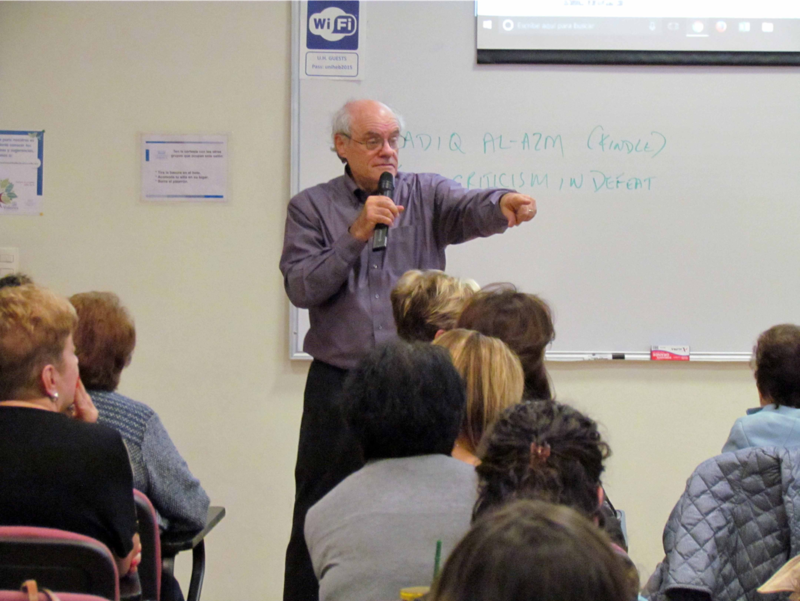 October 9, 2018: CIE Vice President of Curriculum and Outreach, Rich Walter delivered an adult education program entitled, "Sharing Israel's Story through Primary Sources," at Temple Shaaray Tefila in New York. August 31, 2018: CIE Vice President Rich Walter and Weber School Israel Programs Coordinator Michal Ilai lead the first of three seminars for 12th grade students as they prepare to spend a month in Israel. August 25, 2018: CIE Vice President of Curriculum and Outreach, Rich Walter led a number of session for teens and youth professionals at the NFTY-SAR Liz Leadership Training Institute at Camp Coleman. Sessions included: Using games to teach and learn about Israel, Case Studies in Israeli Leadership, and Embracing Multiple Opinions of Israel. August 23, 2018: CIE Vice President of Curriculum and Outreach, Rich Walter facilitated a conversation on "Embracing Multiple Opinions of Israel," for the Jewish Federation of Greater Atlanta's Board of Advisors. June 26, 2018: CIE Educational Specialist Steve Kerbel led an interactive program on Israel's geography for campers at In the City Camp in Atlanta. May 22-24, 2018: CIE delivered an Israel enrichment seminar for summer camp staff. Cohorts included staff from Camp Judaea, Camp JORI, Camp Young Judaea-Texas, Camp Young Judaea Sprout Lake, URJ Camp Coleman, In the City Camp, MJCCA Day Camps, National Ramah Commission. Special thanks to Rabbi Avi Orlow and our friends at Foundation for Jewish Camp for their support. May 9, 2018: CIE Day School Education Specialist Dr. Tal Grinfas-David led a dynamic learning session for the faculty of the Golda Och Academy in West Orange, NJ. The session was part of a two day site visit for the school's participation in CIE's Day School Initiative. Tal wrote about this exciting project, which CIE launched this year, in eJewish Philanthropy. April 29, 2018: CIE provided a variety of engaging activities on Israel's geography at the Atlanta Jewish Community's [email protected] celebration. Learners of all ages used our giant map of Israel to explore some of the country's special places. April 17, 2018: Rich Walter (AKA Theodor Herzl) and ninth grade students at Atlanta Jewish Academy engaged in a simulation of the First Zionist Congress. April 13 - 15, 2018: CIE hosted the Teen Israel Leadership Institute. Twenty-four tenth and eleventh graders from nine sates and Israel engaged in intensive and hands on learning about Israel and Zionism. March 25, 2018: Ken Stein presented "Israel at Seventy: Unfinished" at Congregation Or Hadash in Atlanta, GA.
March 7, 2018: Ken Stein presented, "Owning Israel's Story" to Middle and High School students at the Tarbut V'Torah Jewish Day School in Irvine, CA. "Israel at 70: Celebrating Moments and Individuals" for residents at the Sinai Residences. March 1, 2018: Rich Walter led a webinar on Israeli politics for teens in NFTY's Southern Area and Southern Tropical Regions. The webinar focused on differences in US and Israeli elections, how Israel's government works, and a look at some of the contemporary issues being discussed in the Knesset. February 16, 2018: Rich Walter participated in a special "Israel in-Depth" learning session as part of BBYO's Jewish Enrichment Institute- Speak Up for Israel track during the BBYO International Convention. January 21-22, 2018: Ken Stein delivered a keynote address for 420 students and served on a panel on "Israel Issues and BDS - Managing the Campus" with Asaf Romirowsky, Michael Atkins, and Judea Pearl at the Stand With US International Conference in Los Angeles. January 21, 2018: Eli Sperling presented a lecture, “Demographic Issues Facing Modern Israeli Society,” for the Teen LFT Program of AJC Atlanta. November 27 - December 4, 2017: Rich Walter served as a scholar in residence for the Atlanta Jewish Teen Initiative’s “Teen Innovation & Engagement Cohort: Israel Seminar.” Participants in the eight-day seminar in Israel represented six congregations, youth movements, summer camps, and arts organizations from greater Atlanta. September 1-4, 2017: Eli Sperling presented two sessions as part of Limmud Atlanta/Southeast: "Jewish-Arab Intercommunal Violence" and "Music and American Zionism." August 20, 2017: Rich Walter facilitated a special workshop for members of Hadassah of Greater Atlanta entitled, “Let’s Talk About Israel: Train the Trainer." August 13, 2017: Eli Sperling guided participants at the Atlanta Jewish Education Directors' Council annual professional development Kallah during a session entitled, “Teaching Jewish Texts Through Music"
March 27 - 31, 2017: Atlanta Jewish Academy Seminar on Modern Israel - Year two of a four-year project with the high school students at Atlanta Jewish Academy. The theme of this year’s seminar was Israeli politics. Using materials designed by CIE, students learned about the elections process, different branches of Israeli government and engaged in a Knesset simulation. March 25, 2017 - Rich Walter and Rabbi Ellen Nemhauser presented, "Israel:Behind the Headlines," as part of the National Council for Jewish Women (NCJW) conference in Atlanta. The seminar focused on using primary source documents to better understand complex issues such as Jerusalem, Settlements, and the Two-State Solution. March 21 and 22, 2017 - CIE presented two sessions at at the 2017 CCAR Convention in Atlanta. On March 21, Ken Stein led "Using Sources and Documents to Retell the June 1967 War," and March 22, Rich Walter led, "Practical Ways to Engage Teens with Israel." March 14, 2017 - Ken Stein led a seminar, "Israel in Context: A Day of Israel Learning," for rabbis in Northern California as part of CIE’s rabbinic seminar series. February 23rd, 2017 - Ken Stein delivered the 2017 Feinberg Lecture at Whittier College in Whittier, CA, "Arab-Israeli Negotiations: Why they worked in the ’70s but not now." February 17, 2017 - CIE Rabbinic Fellow, Rabbi Ellen Nemhauser engaged with student participants in CIE's "Teaching Israel: Peer Israel Education Program for Reform Movement Israel Program Alumni." The program was a joint initiative of CIE and the Association of Reform Zionists (ARZA). Participants took part in two in-person seminars (October 2016 and February 2017) and several webinars dealing with a variety of topics relating to Israel and pedagogy. Each participant then planned and delivered an education program on Israel in their home communities. "Understanding the Campus Atmosphere: BDS & Anti-Semitism and Other Problems that You May Encounter," at The Temple in Atlanta, GA. Both programs were part of a three part series on Israel on Campus underwritten by grant from the Breman Foundation. December 26th, 2016 - Teens at the 2016 United Synagogue Youth International Convention in Dallas, TX construct a timeline of events in Israel/Zionist history. The session was one of two classes presented by CIE at the annual gathering of Conservative Jewish youth. December 4th, 2016 - Synagogue educators in Greater New Haven, CT learn about immigration to Israel in the 1950s as part of a community wide professional development day. CIE Associate Director for Israel Education Rich Walter created the activity as a model for using a variety of primary sources and constructivist techniques in teaching about Israel . November 17th, 2016 - CIE Associate Director for Israel Education Rich Walter engages 12th grade students at the Weber School in Atlanta in a simulation of the First Zionist Congress. The simulation was part of the senior class's preparation for their upcoming Israel trip. November 3rd, 2016 - CIE Rabbinic Fellow Ellen Nemhauser and David Bernstein, President and CEO of the Jewish Council on Public Affairs, moderated a discussion for Atlanta Jewish Community Leaders on How to address the threat to our community that stems from disagreements over what is best for Israel. The program was sponsored locally by the Atlanta Jewish Community Relations Council. October 31, 2016 - CIE President Ken Stein and Rabbinic Fellow Ellen Nemhauser teaching and learning with rabbis in Long Island, NY as part of CIE's rabbinic seminar series. October 13th and 14th, 2016 - CIE President Ken Stein and Associate Director for Israel Education Rich Walter each led professional development seminars on teaching about Israel and the Arab-Israeli Conflict to participants at 2016 Georgia Council for the Social Studies Annual Conference. July 2016 - CIE Rabbinic Fellow, Ellen Nemhauser, leads the service at the National Hadassah Convention in Atlanta, during which she delivered a D'var Torah and followed with a discussion of the current status of women in Israel. July 2016 - CIE's Associate Director of Education, Rich Walter, spoke to Hadassah Associates, men who stand in support of Hadassah’s mission to advance medical research, healing, and education, during the National Hadassah Convention in Atlanta. June 2016 - Ellen Nemhauser, CIE’s Rabbinic Fellow, poses with CIE Board of Directors Member, Deborah Lauter, at the White House in Washington, D.C. to promote interfaith dialogue. February 2016 - Eli Sperling, CIE’s Israel Specialist and Assistant Program Coordinator, hosts keynote presentation on Israeli music during the 64th annual Jewish Educators Assembly Conference in Mount Laurel, N.J.
February 2016 - CIE Associate Director of Education, Rich Walter, presents educational workshop on Israel for students at the Epstein School, Atlanta, Ga.
December 2015 - CIE’s Rabbinic Fellow, Ellen Nemhauser, holds workshop for fellows at the Jackson, Miss. headquarters of the Institute for Southern Jewish Life. November 2015 - CIE’s Eli Sperling, Israel Specialist and Assistant Program Coordinator, and Rich Walter, CIE’s Associate Director of Education, host seminar on Israel education at Bronfman Jewish Education Centre in Montreal, Quebec. October 2015 - CIE’s Rabbinic Fellow, Ellen Nemhauser, and Rich Walter, Associate Director of Education, present a three-series workshop, “Community Conversations about Israel,” at Adath Israel Congregation, Lawrenceville, N.J., and Har Sinai Temple, Pennington, N.J.
August 2014 - Israel Specialist and Assistant Program Coordinator for CIE, Eli Sperling, moderates a panel discussion: “Reading Between the Headlines, Understanding How Violence and Political Tension Fit into the Greater Arab/Israeli Conflict during LimmudFest 2014, at Camp Ramah Darom, Clayton, Ga.